Many a time parents, teachers and other care givers are at a loss to understand how to deal with issues in the daily lives of children, whether they are academic interventions or behaviour management concerns. unable to address individual needs. The end result is further confusion and the concerned parties are ill-equipped to take informed decisions and are often driven by a herd mentality, which further compounds the problem. The common refrain of most students is that they are rarely understood by their parents, teachers and most often the people who they depend on completely, their own peers or contemporaries are unable to deal with issues that they are all grappling with. There are cases where children lead lives that are fraught with double standards. They have nowhere to go and are at a very young age exposed to aspects far beyond their understanding and therefore end up as confused adults, who are incapable of taking care of themselves, leave alone adding productively to the fabric of society. More often than not, in the race to grow up too soon, children tend to get attracted and later addicted to vices that only spell doom. Structured modules are conducted to sprinkle their environment with examples of right role models and inviting their interpretation and helping them to develop the ability to weigh pros and cons. 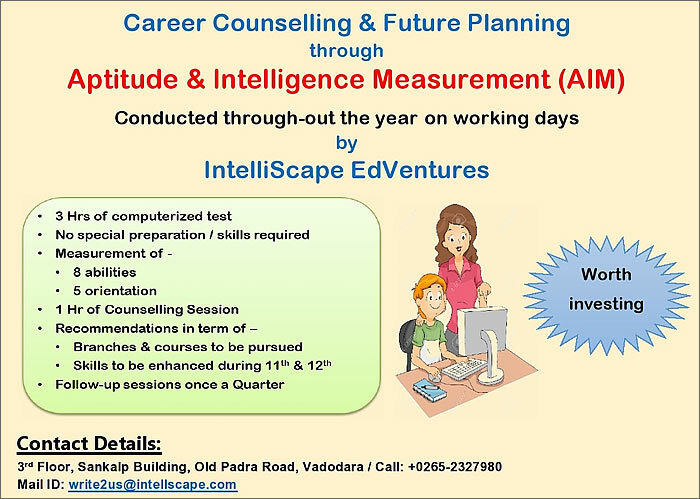 Intelliscape EdVentures, a one-stop place for everything to do with managing children and young adults, providing expert guidance and support through workshops and seminars; individual one to one intervention for parents, students and teachers and value added modules for all categories. Develop capability of teaching and support staff by imparting leadership, domain and behaviour competencies. Develop competencies of children pertaining to academics, musical – rhythmic, visual – spatial, verbal – linguistic, logical – mathematical, bodily – kinesthetic, intrapersonal, interpersonal, naturalistic and existential. Propagate effective teaching methods leveraging technology such as multi-media equipment, software, internet, on-line tutorials, etc. Solve problems and complex issues like inconsistent academic performance, lack of competent teaching staff, poor academic results of mile-stone classes, below par performance in sports, etc. Manage school operations like admissions, syllabus plans, scheduling and operations of classes, people and staff management, financial management, infrastructure management, etc., including day-to-day activities. Counsel students to aspire for studies in reputed institutions in India and abroad and facilitate the process for admission.